A small town tech startup’s prediction of the future of work. The steady growth of America’s remote workforce is set to spike exponentially as new technology provides remote teams with the collaboration and culture-enhancing benefits of shared, physical offices. At Swivel, we believe in a world where people get to live wherever they want no matter where they work. That said, we are not suggesting all industries will be impacted equally. We’re primarily focusing on what is often referred to as “knowledge work,” which consists of different kinds of non-routine, cognitive jobs such as professional, managerial, or technical occupations. In the 1980s, American workers fit into roughly 3 equal categories. There were about 31 million knowledge workers, just under 30 million people doing routine manual work, on assembly lines or in warehouses, and then about 30 million with routine office jobs like bookkeepers, filing clerks, bank tellers, and so on. According to the Wall Street Journal, however, over the last three decades, almost all job growth has been in non-routine work categories. The number of people in knowledge work jobs has more than doubled since then, and there are no signs of that trend slowing down. 30 years ago, if you were to ask your boss to let you work remotely, you’d almost certainly be told no. And understandably so. When your employer went to weigh the pros and cons of your request, comparing the benefits of denying it on the left to the benefits of approving it on the right, everything would logically support keeping you in the office. The rare employees who did get approval to work remotely reaped almost all the same benefits current remote workers enjoy (e.g. living and working where they choose, having more flexible schedules, personally customizing their workspaces, and higher overall levels of happiness). Their employers, on the other hand, risked losing a great deal. Attending team and company meetings. Receiving team communications via memos or bulletin boards. Processing piles of required paperwork. Punching a time card to track hours. For a long time, the scales were considerably tipped in favor of office-based work. Culturally and technologically, remote work just didn’t make sense. Fast-forward 30 years to the present, and the landscape has changed dramatically! Numerous advancements in technology have made working remotely entirely feasible. So feasible in fact that last year, 43% of Americansspent at least some of their time working remotely. Other studies show that nearly 40% of today’s employees work offsite on a regular basis. The debate is hotter than ever. Compelling arguments are being made on both sides with dizzying frequency. Right now, the scales are pretty evenly balanced. While individuals continue to be the primary driving force behind remote work adoption, more and more companies are seeing the value of a remote workforce. Some companies are forgoing company headquarters completely and deliberately choosing to operate entirely remotely. Participate in the majority of team communications in the exact same way their office mates do (e.g. via tools like email and Slack). Facilitate all sales and support activities through cloud-based CRM systems. Login to diverse cloud services and edit numerous file types with multiple coworkers simultaneously. Effectively participate in team meetings via videoconferencing. Process HR requests and handle most company processes digitally. Stay in sync with shared digital calendars. 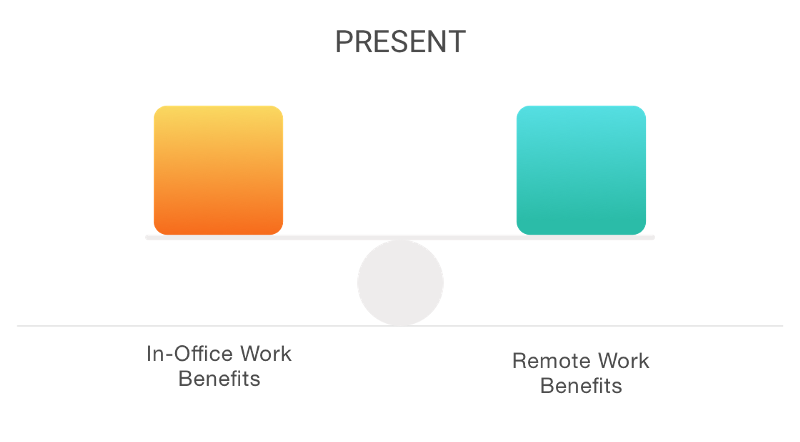 Major advancements have been made with remote work, but a major gap still remains between what remote workers and in-office workers experience. In a recent informal survey we conducted on social media, we asked people what they felt the biggest difference was between working in an office or working remotely. Over 50% of the participants who responded said the biggest challenge with remote work was the lack of serendipitous, unplanned interactions, like those that regularly occur in a physical office. We believe that as long as this gap exists and there continues to be a palpable difference between the way remote teams and office teams are able to collaborate and create a strong culture, then companies will continue to resist fully embracing remote work. We predict that as soon as improvements in technology allow remote teams to interact and collaborate with each other the way people in an office can, then remote work will explode — catching many industries and communities completely off guard. 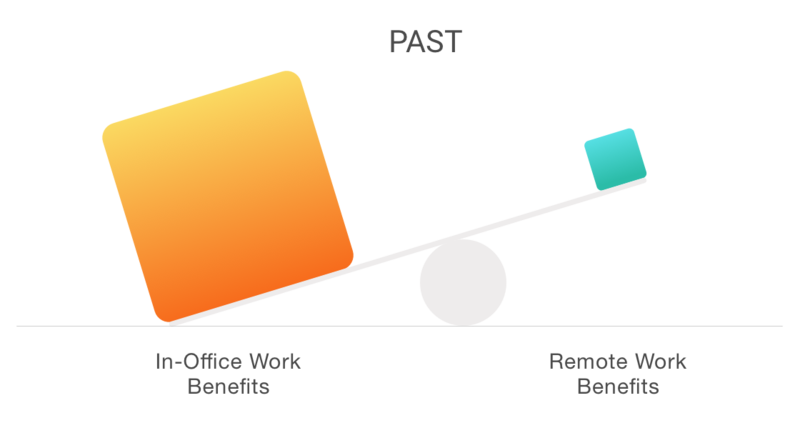 The scales will tip rapidly and dramatically towards remote work. The reason adoption and expansion of remote work won’t continue on its current trajectory and will spike dramatically instead, is entirely due to an upcoming change in leadership at the helm of the movement. For decades, those tirelessly advocating and pushing for the expansion of remote work opportunities have been the individual workers who desired the improved lifestyle that comes with it. However, as soon as new technology evens the playing field by granting remote workers access to the few remaining interactions and benefits still only available while working in a physical office together, then the debate will be over. Remote work will be crowned the uncontested winner. Companies will quickly catch on to the fact that they and their employees can access all the documented benefits of working remotely while also retaining the benefits of working in an office together. This realization will dramatically usher in massive change of leadership with companies, not individuals, taking an undisputed lead in championing the benefits of remote work. Some companies are already stepping into this role. Dell computers already has the goal of having 50% of its workforce work remotely by 2020. 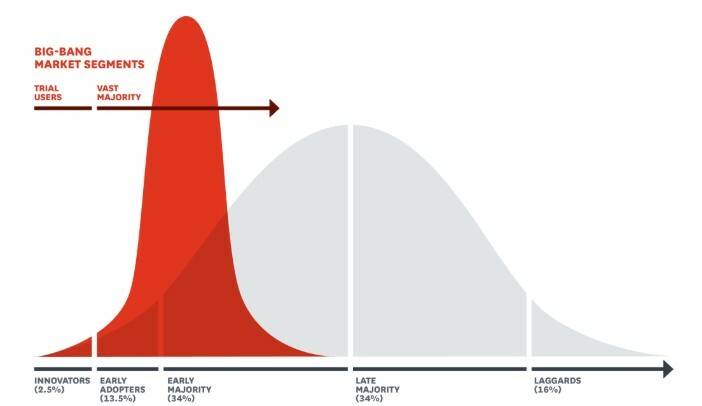 This component is why we’re predicting this change will not follow Roger’s Bell Curve by gradually unfolding according to standard innovation adoption lifecycle models. We predict instead it will be more of a big-bang disruption. The final remaining benefits of working in a shared office will become available to remote teams through new technologies like Swivel. Companies will be able to hire from anywhere by being able to tap into a global talent pool. Organizations will be able to provide their employees with built-in benefits such as increased time with family & friends as a result of being able to live closer to them and eliminating long commutes. Companies will significantly reduce costs of maintaining expensive office spaces. By now it’s probably clear how this massive shift is going to transform rural America. Once companies begin pushing to transition to remote workforces, massive numbers of workers will no longer be tethered to offices that predominately tend to cluster in major metropolitan areas. Millions of well-paid employees are going to unexpectedly find themselves completely free to choose where they would like to live without experiencing a disruption in their employment. Consider for a moment what’s most likely to influence their search for a new place to live and work. Closer access to outdoor recreation. Better communities for raising a family. Every one of these items is much more likely to be found in rural towns and cities across America than in the larger metropolises. Some forward-thinking communities, states, and companies area already catching on. Vermont recently passed legislation that will pay you up to $10,000 to move there and work remotely. Bay Area tech company, Zapier.com, recently announced their “De-Location Package” of up to $10,000 to move out of the Bay Area. At Swivel, we’re a small remote company, based in the small remote town of Walla Walla, WA. We are located four hours from Seattle, Portland, or Boise in the Southeastern corner of the state. Even though Walla Walla is located in a high-desert and is home to only about 30,000 residents, we’ve figured out how to attract people from major metropolitan areas. Our secret is getting as close as we possibly can to matching the cultural and lifestyle benefits of a big city (including blazing fast fiber internet), while retaining all the charm, slower pace, friendliness, and affordability of a small town. We believe that that is exactly what new remote workers are going to be looking for. The small towns that are the best at giving new remote working families the ability to give up as few big-city benefits as possible, while providing them with the most small town benefits available, will be the ones with the biggest opportunity to benefit from what’s coming. Being enthusiastic advocates of remote work does not automatically make us advocates of working from home. Having the option to work from home is great! Having to always and only work from home is not so great. For over 15 years I dreamed of starting a new career that would allow me to work from home. It just seemed so perfect. In 2012, I started my own consulting business from home and for several months was in bliss. I felt like my dream had come true. Then I started catching myself not leaving the house for several days at a time. I’d see pictures on facebook of my old team going out to lunch. I started feeling grumpy and didn’t know why. And then I heard about a coworking group at a nearby library. I had never heard of such a thing. I found them on Meetup and they talked about how you can do your own thing but that you didn’t have to do it alone. I started working with them on a regular basis and my grumpiness went away. Turns out I was feeling lonely and isolated. As much as I loved my freedom and independence, I also needed social interaction and the sense of belonging that a community of coworkers fosters. A few years later I opened a small coworking space in Walla Walla and continue to work there most days. I’m living in the future! I’m able to enjoy a sense of being in the same room with my remote work team using Swivel, while actually being in the same room with a separate, diverse community of caring and intelligent people that I can talk to and go out to lunch with at the exact same time! 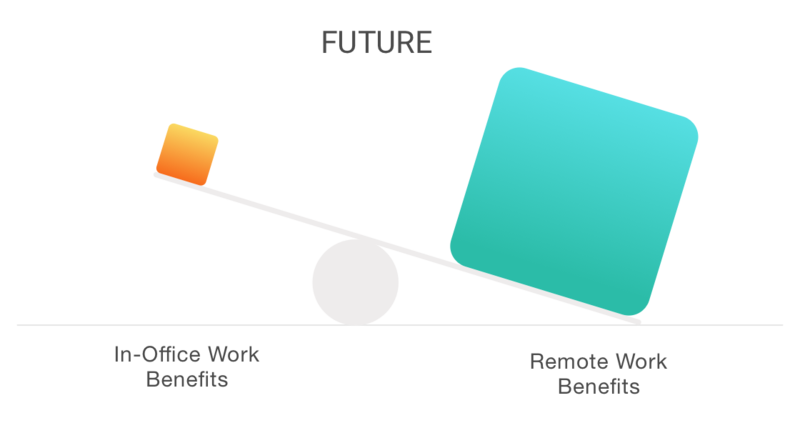 Which is why I believe that the future of remote work is two-pronged: new technology to provide your team with same-room collaboration on one hand, and a strong coworking community to provide you the personal and social connection you need on the other.